Hello Lovelies! 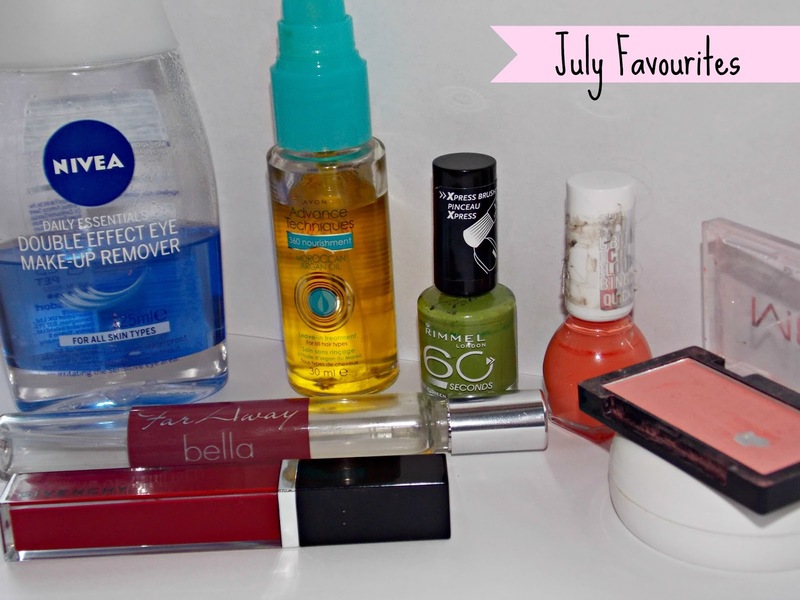 I haven’t done monthly favourites for ages; I think last one I posted was my ‘April favourites’ which was so long ago! I actually cannot believe its August already… this year is literally flying by. I got this while it was on offer at Superdrug for around £1.60, I didn’t expect much however it is the best eye make-up remover I ever used. One cotton pad and all my eye make-up wipes off straight away even waterproof eyeliner and mascara. Also it doesn’t make my eyes water or sting. I love it and will definitely re-purchase it after it runs out, totally recommend it! I mentioned this in my ‘Updated hair care routine’; I use it before I dry my hair on my ends. Afterwards it leaves my hair feeling really smooth and soft. Also I noticed my ends aren’t so dry anymore. If you can get your hands on it, I would defiantly recommend it! I love this stuff! I got this nail polish while I was on holiday, as I left all mine at home. It’s very pigmented and fast drying. I love the brush as it makes it a lot easier to paint your nails with. I wore it on my finger nails as well as my toes and it looked gorgeous, especially with a tan! I also picked this up while I was on holiday, if you have been reading blog for a while you might already know that Miss sporty nail polishes are some of my favourite! I love the formula of them as well as the brush. This colour is a lot brighter in real life; it looks amazing on your toes as well as your fingers nail. It makes me look a lot more tanned than I am. This is certainly one of my favourite summer nail polishes! I often wear pink blushers; however I saw this blusher on someone’s blog and had to have it! I actually took it with me on holiday and it looked amazing with my tan. As it is a coral colour it looks a lot more natural than pink blusher. For £1 you can’t complain, amazing! This is another product I had with me on holiday; I moisturized my skin in the morning and night as being in the hot sunny weather all day my skin tends to get dry. I love the fact this moisturizer isn’t thick and applies really well. Plus it doesn’t take forever to soak into your skin. It leaves my skin really moisturized and soft! My mum bought full size bottle of this perfume and received this as a gift, it’s a perfect handbag size. The perfume itself smells really nicely and fresh, also it does stay on for a very long time! I got this as a gift from my lovely mum, after I got back from my holiday! She knows how much I love wearing bold lips and picked this up for me! I couldn’t believe how pigmented this lip gloss was! Also it stays on my lips like a stain, amazing! I'll have to check out Avon Advance Technique Moroccan oil, as I just can't afford moroccan oil. Just about to hop over to you hair care post! Thanks for the link. I didn't know Avon had moroccan oil! Definitely going to try it.